Habitat Restoration Projects in the Mook! We help landowners get the expertise and money needed to make habitat improvements on their properties, and the best part is it’s all voluntary. The Tillamook Bay Watershed Council partners with private landowners to implement habitat restoration projects on all five Tillamook Bay rivers, from the headwaters to the ocean. These projects include culvert replacements for fish passage, large wood placement for sediment retention and nutrients, and riparian plantings for cooler water. Occasionally they can include dam removals, tide gate replacements, and road obliteration. Biologists and engineers gather on the crest of Skookum Dam to discuss plans to excavate a notch in the structure. TBWC photo. One of the earliest water sources for the City of Tillamook was Skookum Lake, high in the headwaters of the Tillamook River. The City built an earthen dam on top of a natural slide to create Skookum Reservoir in 1965. Fish passage was not a consideration, meaning that Coho salmon and cutthroat trout were cut off from the lake and all upstream habitat. But after a half-century of use, the dam was found to be a hazard to homes and bridges downstream, and the City decided it should be decommissioned. The Tillamook Bay Watershed Council was approached by the City to help to build a partnership around the dam removal project. Within a year we successfully combined municipal funds with federal and state fish restoration dollars to fund the “notching” of the Skookum Dam. The project will reconnect the one and only lake system in the Tillamook Bay Watershed, allowing Coho, cutthroat and other aquatic organisms open passage. And 2017 is the year the dam will be notched! Stay tuned to this site for project updates starting in July. UPDATE: Skookum Dam was successfully breached in the summer of 2017! LKE Corporation won the Skookum contract and did a superb job restoring natural stream function to Fawcett Creek in the headwaters of the Tillamook River. Photo courtesy of River Design Group (RDG) and their awesome little drone, Kestrel. Fawcett Creek runs free again, restoring access for migratory fish to Skookum Lake and approximately 2 miles of upstream habitat. RDG photo. This photo shows quite clearly how the old roadbed is taking up roughly half of the South Fork Trask’s river channel, which serves to speed up flows and trigger erosion downstream. TBWC photo. The last 20 years have seen major improvements in forest practices, particularly with regard to road maintenance and sediment controls. Today many of the old haul routes that were once significant sources of fine sediments have been decommissioned. That has made our rivers a bit cleaner, but in many cases the old road beds are still in place, restricting the natural flow of rivers and tributaries. Such is the case with a one-mile section of the old Coast Range Road on the upper South Fork of the Trask River. In 2016, Stimson Lumber and the Oregon Department of Forestry came together with the Tillamook Bay Watershed Council with the goal of removing the roadbed of Coast Range Road from the river’s channel. We consulted with restoration experts and came up with a plan to excavate key sections of the road and to place a number of large wood structures throughout the stream reach. Together we managed to get a sizeable grant from OWEB to make this plan a reality, and we expect to carry out the project in the summer of 2017. Stay tuned to this web site for updates starting in July. We did it! Thanks to John Sanchez of Cutthroat Consulting and Bud Innis, operator for Custom Excavating, for a brilliant job installing 17 large wood structures and removing the old roadbed from the stream channel. Completed in 2017. TBWC photo. The summer of 2016 was devoted to lower Mill Creek, an impaired tributary to the Trask that flows through residential and farm land. TBWC partnered with the Port of Tillamook Bay, Tillamook County Parks, Oregon Department of Fish and Wildlife and the Oregon Youth Authority to add much needed large wood structures throughout a one-mile reach of Mill Creek bordering Anderson Hill County Park. We also moved the fence line away from the river, providing an additional 1.9 acres of riparian area to be planted with native trees and shrubs. The project was successfully completed in August of 2016 with the assistance of Steve Trask of BioSurveys and a team of equipment operators from Trails End Recovery. Two months later, after a series of high water events, we surveyed the stream and were pleased to find Chinook and Coho salmon staging and spawning throughout the project area. And as recently as January 16, we were still seeing adult Coho using our log jams as cover. 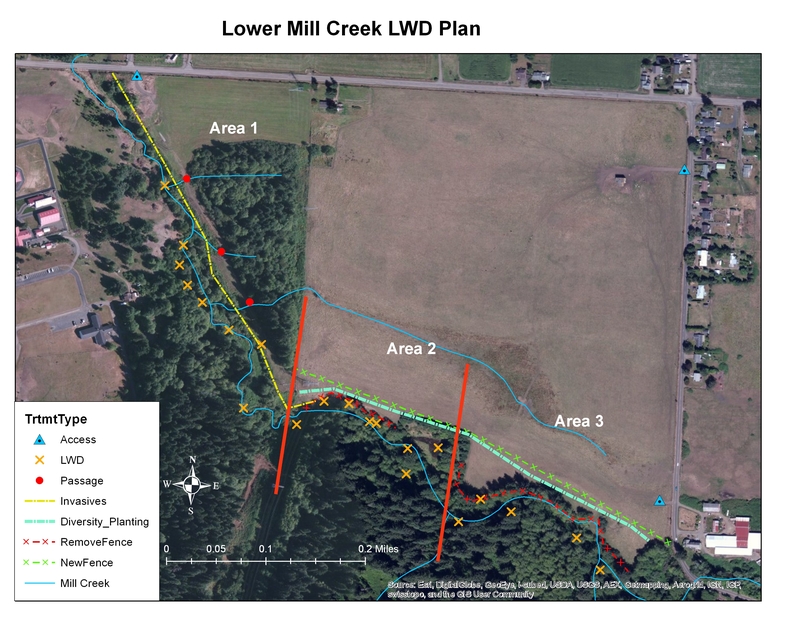 TBWC has big plans to restore connectivity in Mill Creek by replacing undersized culverts throughout the drainage. So far we’ve knocked out two barriers, and we’re in the process of knocking out another three barriers in 2019. Aerial image showing the location of three fish-passage barriers scheduled for remediation in 2019. We’re still writing grants and raising money for this major Salmon SuperHwy effort! The TBWC presents Tillamook County Commissioners with an update on Council activities every fall as part of its charter. These presentations give an overview of each season’s restoration projects as well as our community outreach and education programs.